Even though students are doing a lot of work on computers, laptops and iPads nowadays, the skill of handwriting is still very necessary. However, you can also use technology in order to improve handwriting skills. 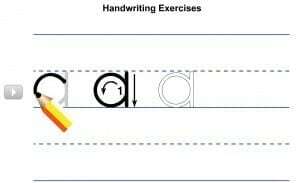 Here are a few examples to teach or learn handwriting on your Interactive Whiteboard from basic, intermediate to advanced level. For the lowest grades you can start with learning to write patterns. Choose one of the various writing patterns at the top left. Press the ‘Play’ button to show the animation to your students. 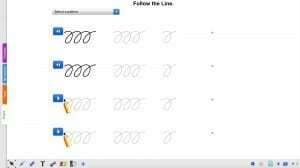 After showing the animation of the writing pattern, practice the pattern with your students. Once the student is in control of writing patterns, go over to the writing letters tool. 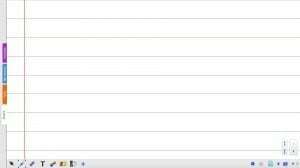 It let you choose from various types of writing methods, including: D’Nealian Block, D’Nealian Cursive, Zaner Bloser Manuscript or Zaner Bloser Writing. You can select your letter(s) of the day and practice the normal and capital form. This technology can help you to revive handwriting. In the last stage you can use one of the available handwriting sheets and practice words and sentences. Choose between line spaces and format that fits best within your lesson. For the lowest grades use the handwriting background with the dotted line in the middel. So, that your students can easily figure out the difference between capital and normal letters. 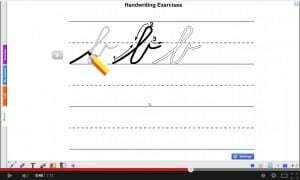 This video Teacher Timo uploaded on YouTube visualizes nicely how to use the handwriting with letters activity. Do you make use of technology in order to teach handwriting as well? Let us know about your experiences!